March here in Ireland generally sees the last few mild morning frosts of the year and the return of a little heat to the air. As the spring rains wash the salt off the roads, more and more bikes are dragged from their winter hibernation. Those of us who ride throughout the year can at long last remove the protective wax from our bikes to see if there is still some bright metal underneath. Around St. Patrick’s Day, if the weather is kind, increasing numbers of bikes on the road brings a real feeling of celebration as our biking freedom is reborn. There are a host of sites throughout the whole of Ireland associated with our patron saint, so in homage to his legacy, and to the return of the sun, I planned a trip tracing Patrick’s story. To avoid being knee-deep in pilgrims at some of these sites, I did not attempt this run on March 17th proper! The start was an easy choice. While Patrick was born in a Britain that was under Roman occupation, Ireland in the 5th century AD remained Celtic, a culture of loosely associated clans with a penchant for raiding their neighbours of whatever wealth could be spirited away. Among the spoils of one such raid was the young Patrick, who, in his teens, was put to work as a slave, tending sheep for his new master on an oddly profiled hill in what is now County Antrim. This is Slemish, a plug of volcanic rock rising steeply above the surrounding countryside near the town of Ballymena. Departing the familiar roads of the Ards Peninsula, I kept watch for homicidal car drivers. Having jumped from this in Belfast, I took the M2 motorway north along the shore in the shadow of Cave Hill, a site loaded with legend and history, then onto the Antrim Plateau. The old BMW was running sweetly as we hammered on, slowing only for the occasional tardy car driver. Any such behaviour, particularly on main roads, is always tempered by the imminent appearance of a speed trap and by the ever-present threat of some other idiot road user making a stupid move. You may ride well, but must always take account of the lowest common denominator. A small detour took me into Antrim town to check out a bike auction that included a restored Brough Superior (way out of my league). There were also a few low-mileage, mid-90s bikes that looked like they could be good deals. The ancient Brit and Jap contingent from the 70s or before looked like too much scrap or too much money to me though. It’s difficult not to get distracted at any place where bikers meet, and I spent far too much time chewing the fat and listening to tall tales before getting back to my purpose for the day. On the road towards Ballymena again, I knew that Slemish lay to my north, so to get off the main road, I turned off through the village of Kells and used the maze of back roads to zigzag in that direction. From tight curves in stream-fed valleys, the ground rose into an undulating farmland, then into an area of open moor, revealing the hill off in the distance. With something to aim for now, my focus narrowed. I doubt if I could follow this particular route again, but it doesn’t matter. The roads I took were good, but probably no better than the roads I could have taken. After my 81-mile morning, I arrived in a busy car park from where energetic walkers were setting off to climb the last 600 rocky feet. After a brief look around and a few photos, I hit the road once more. Patrick escaped from his life on Slemish after six years and, after many adventures, made it home to his family. From there, he followed his father and grandfather into the church, becoming a monk. Then, a vision told him to return to “save” us poor, heathen Irish. From his return and his travels come the myriad sites associated with his name. There can be few places on this whole island where you would have to go more than 20 or 30 miles to find some link to our patron saint. I remembered a trip when Trish and I came across a site while exploring the Clogher valley in County Tyrone. While I had no idea of its exact location and could find nothing marked on any maps that I had, I remembered it was signposted from a main road, and that we eventually went to Armagh that day, so surely it couldn’t be that hard to find? On dropping down again from Slemish, my plan was to head west, avoiding the main road that went along the top of Lough Neagh and then off towards Derry. Navigation was approximate, since I had no map with me. You can’t go too far in such a small country without coming across some landmark that will point you in the right direction, and experimenting with the smaller roads is all part of the fun. Along high hedged, sun-dappled roads, I fell in behind an old rigid framed Velocette for a while, matching my speed to his. At a guess I would date it to the 30s, and from the size of engine, I doubt that it would have been more than a 250. Its twin fishtail exhausts barked crisply as he cruised along at a steady 50, and I could see he was thinking well in advance as he rode to allow for the bike’s small vintage brakes. After a while, he turned off with a wave for Ballymena, leaving me wishing for the opportunity to sample such a bike. The small roads were slowing my progress too much, and I still had a lot of miles to cover before dark, so at the quaintly named village of Ahoghill, I returned to A roads. The A42 has been largely bypassed by the newer, dual carriageways to its south, and while it still followed the landscape, it was fast, well-surfaced and relatively free from other traffic, a much more interesting route to travel than sitting amongst the herd. At Portglenone I turned south through Bellaghy with its fortified 17th century plantation house (known as a Bawn), then to Magherafelt and on down the west coast of Lough Neagh, the great lake in the centre of Northern Ireland, which at 151 square miles is the largest lake in Britain. While it is not exactly on the scale of Lake Superior, it was still capable of breeding clouds of insects, enough to provide a good coating on my visor, jacket and headlight. This is a modern road though, and by Cookstown I had made up sufficient time to allow me to take a more scenic route through Stewartstown and Coalisland before re-joining the main road at Dungannon. Another quick but eminently forgettable blast west along the main road that goes to Enniskillen, soon brought me to the small town of Augher. From here the A28, one of the greatest biking pleasures in the north of Ireland, follows the County Monaghan border east to Armagh. I had guessed that the next site would be off this road, and indeed, it was signposted down a woodland road in Favour Royal Forest. Leaving the bike to cool down after 163 miles of labour, I followed a marked path down into a heavily wooded glen. The complete silence there after miles of listening to the bikes engine and the wind whistling past my helmet was startling. Sheer valley sides verdant with pine and freshly opened ferns felt positively primeval. As I walked amongst this sudden greenery it was easy to see this place among the great Irish myths of the Ulster cycle. For a moment it was as if Cúchulain and the high kings walked with me, such is the atmosphere of this place. After a few minutes walk the path splits, with one fork narrowing to climb a steep slope along a knife-edged ridge of loose boulders. It’s not that high, perhaps 40 or 50 feet, and at the top was my second destination, Saint Patrick’s Chair and Well. If the trees were cleared as I presume they were when this place was in use, the great chair, carved from a single block of sandstone and originally used by the Druids, would dominate a small natural amphitheatre, a true place of pagan ritual. The well is less spectacular in size, no more that a hemispherical hole of about 2 pints capacity, cut into the rock 10 or 15 feet below the chair. Legend has it that the well never runs dry and that its water can cure disease, although what it was originally designed to contain is open to a little more debate. With particular success reported for warts the water is obviously not that strong. If the water doesn’t fulfil your needs, then the chair might. A wish made while sitting in it is supposed to come true, but since this won’t happen if you tell anyone the wish, you will never get to know whether I tried it out or not. I can find no reference to Patrick’s connection to this site, or indeed to any published research about its original builders. Early Christians were well-known for taking over pagan sites, thus denying access to their original use, so since Patrick is supposed to have passed this way, he may well have used a natural meeting place like this to convert local tribes. When the bike fired up, the illusion of the forest passed and an expectation of the road ahead grew. Twenty-five miles of uninterrupted crests and curves awaited me, a glorious, sinuous celebration of everything that a good bike road should be. The brief hassle of Armagh’s traffic seemed multiplied, and the grand Georgian architecture of the town merely walls to close me in. I passed the last of the traffic on an uphill stretch, then wound another twenty miles on the old A51 and A50 through Tandragee to Banbridge. Just before Trandragee, a crest in the road hides a corner that sweeps sharply to the right. I slowed on the crest before peeling off hard, as near to perfect as I have ever achieved on this corner. Motorcycling nirvana. At Banbridge I came momentarily back to earth as I crossed the main road between Belfast and Dublin. Everything about it, its traffic, its uniformity, its sheer monotony was the anti-thesis of the roads I had just left. 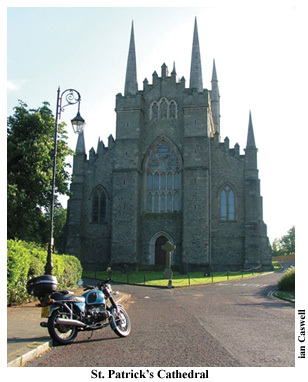 I got off within a few hundred yards, preferring to follow a series of minor roads through hilly country to Dromara, Ballynahinch and at last to the town that carries our patron saints name, Downpatrick. The 69 miles I had just travelled since Favour Royal had taken almost an hour and a half, and yet I hadn’t been hanging around. Once more, the moral here is that if you are travelling in Europe off the motorway system, don’t plan too many 500-mile days! In rapidly lengthening evening shadows, I rode up to St. Patrick’s Cathedral. One story of how Patrick’s grave came to be at this site says that on his death at nearby Saul, two untamed oxen were harnessed to a cart containing his body and then set free. Where they stopped on this hill, he was buried and a church founded. Patrick’s stone marker, a large piece of granite from the Mourne Mountains, was only placed here in 1900, marking the legend of his burial in this area, rather than any precise fact. Two other saints, Brigid and Columcille are said to be interred here as well. From Downpatrick to home, the last stage of my day’s journey was a race over familiar roads against impending darkness. By the time I stopped to pick up a few well-earned beers, I had covered 259 miles on a roughly anti-clockwise journey around Lough Neagh. I suppose in honour of the day I should have bought Guinness.